I know what you are thinking. I was thinking the same thing. I could not imagine it, either. Pu'erh tea with fruit flavors? Being a major fan of pu'erh and rather a purist in that regard, I was first surprised, then suspicious. Why mix fruit and pu'erh? Straight pu'erh is good enough! And what is hazelberry? I measure a teaspoon and a half for my twelve ounce mug, cover the leaves with just-boiled water and set a five minute timer. Then I start researching. The name "hazelberry" is coming from the combination of hazelnut and berry (specifically strawberry) flavors in the cup. Additionally, Adagio has added cocoa nibs and creme flavor to increase just how succulent this cup will be! Okay, this has begun to sound quite delightful. The five minutes have passed, and I remove the infuser basket from the mug. The tea has brewed a dark cup, smelling strongly of earthy pu'erh with a touch of cocoa, balanced by heavy strawberry notes. This contrasts with the aroma of the dry leaves, which were heady with pu'erh earthiness and complemented by tangy strawberry tones. The differences between dry tea leaves and the brewed tea always intrigue me. The flavors meld in an interesting manner. 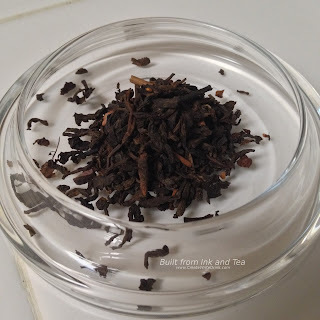 Foremost among them are the pu'erh and cocoa notes, which I can appreciate (especially given that some ingredients, when blended with pu'erh, tend to overwhelm the base tea). Berries hover in the body but complement more than overtake the pu'erh. I am surprised by how much I enjoy the cup. 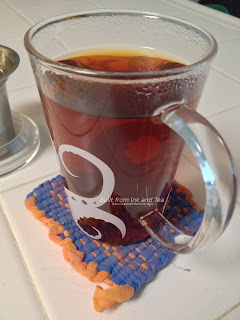 While it is less satisfying as a cup of pu'erh than if it were not a blend (the fruit and cocoa distract from the tea base), I think it serves well as a tasty, fruity cup of tea. Definitely give Pu Erh Hazelberry a try. On my personal enjoyment scale, I would rate it a 90/100. Adagio Teas Pu Erh Hazelberry is available from their website, here.